Price: £1.20 (incl VAT) Sorry, this item is currently unavailable. Click here to receive notification when this product comes back into stock. 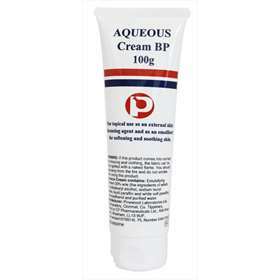 Aqueous cream is a cream for dry or chapped skin. Cream containing: White soft paraffin, Cetostearyl Alcohol, Liquid Paraffin, Sodium Lauryl Sulphate, Purified Water. Preservative: Phenoxyethanol. Relief of symptoms of dry or chapped skin. Adults, the elderly and children: apply to the affected area of skin as required. Cetostearyl Alcohol, Sodium Lauryl Sulfate, Liquid Paraffin, White Soft Paraffin, Phenoxyethanol, Purified Water. Product code: 1103233 Price: £1.20 (incl VAT) Sorry, this item is currently unavailable. Click here to receive notification when this product comes back into stock.